Outcomes of the first phase of ENPI FLEG were reviewed at the NPAC meeting in Russia. ENPI FLEG achievements are reviewed by NPAC members. 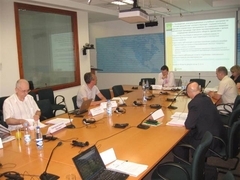 The Seventh and final meeting of Russia National Program Advisory Committee (NPAC) within the first phase of ENPI FLEG program took place in Moscow in the World Bank Representative office on July 11, 2012. NPAC consists of representatives of the Russian Federal authorities, EU Commission Delegation in Russia, and NGOs. It oversights Program progress in Russia, evaluates results at the country level and provides advisory support to Implementing Organizations in their work. Outcomes and success of the first phase of the Program achieved in 2009 – 2012 were analysed and reviewed at this meeting. NPAC members noted with recognition that the Program delivered additional, originally not planned, success and benefits in many areas. For example additional activities were conducted for preventing forest fires (following NPAC recommendations), for informing Russian stakeholders about new EU FLEGT legislation, and securing rights of citizens for access to forest resources. It was recognized in particular that the Program products and experience were used during development of the Russian Forest Policy. Besides that Mr. Alberto Volpato, EC Delegation representative and NPAC member who was present at the meeting informed the audience about prospects of the launch of the second phase of the Program in 2012 – 2017. The meeting resolution text in English can be found below.